Corona del Mar was once California's premier surfing spot, holding the sport's first Pacific Coast competition in 1928. Attempts to tame Corona and to make the Newport Beach harbor mouth safe for watercraft drastically altered board riding, destroying the great "wave-making machine" of Corona and creating the surf giant of today known as the "Wedge." Read about Newport before World War II: experience the Great Rescue of 1925 by Duke Kahanamoku and others, the rum runners of Balboa and the evolution of Newport Bay. Pioneering surfers such as George Freeth, Tom Blake, the Vultee brothers and Pete Peterson helped make a name for the city in surf culture. 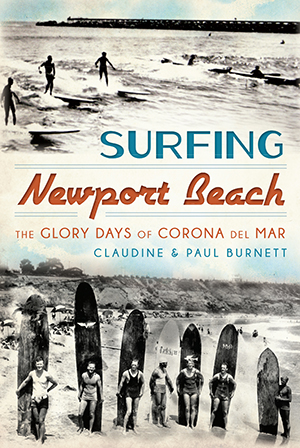 Authors Claudine Burnett and her surfer husband, Paul, have delved deeply into the past, sharing stories that will give readers never-before-revealed facts not only about surfing but Newport Beach and Corona del Mar history as well. Claudine E. Burnett's books include From Barley Fields to Oil Town: A Tour of Huntington Beach: 1909-1922 (1996), Strange Sea Tales Along the Southern California Coast (2000), Haunted Long Beach (1996), and Balboa Films: A History and Filmography of the Silent Film Studio (2007). Paul Burnett has a degree in economics from the University of California, Los Angeles, where he helped organize the university's first surf club. He is co-owner of the premier action sports and surf shop, Surfside Sports (SurfsideSports.com), which started in Newport Beach in 1975.